Take another look at Star Wars: The Old Republic. It’s quite good. Whatever it was that draws millions to Star Wars, many were unconvinced that The Old Republic had it. The feeling of adventure, heroism, mysticism and drama just wasn’t quite right. In the old days, SWTOR just didn’t feel “Star Wars-y” enough for core fans. 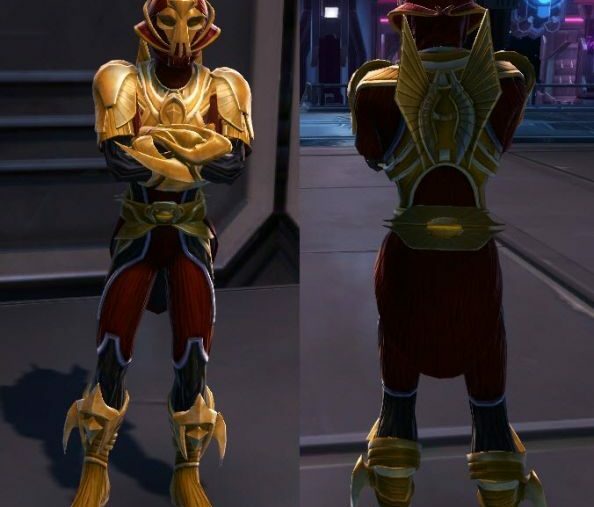 It’s not an opinion I ever held, but I am an extremely patient person and SWTOR, in the early days, was tailored to a player like me. But I struggled to argue with the naysayers on a critical point, it was a poor MMO. Over two years have passed since Star Wars: The Old Republic launched. And it has changed almost beyond recognition. SWTOR still has, and I’ll stand by this point until the Banthas come home, the very best leveling experience of any MMO. With the right class, it’s absolutely unbeatable. Play as a Bounty Hunter and you’ll struggle to clear your name after being unjustly accused of heinous crimes. Play as an Imperial Agent and you’ll be caught between two masters: the Imperial military and the Sith that treat it as a toy. There certainly are a few choke points where stories slow, quests make little sense and scenery is needlessly obtuse; but once you have a few hours under your belt, you’ll spot the areas you can skip without hampering your experience.. Star Wars: The Old Republic was probably Bioware’s biggest story. Missing out, as a Bioware fan, would be a shame. But there was always a hole: the end-game. The headline change to SWTOR’s endgame is the growth of operations The Old Republic’s versions of raids. 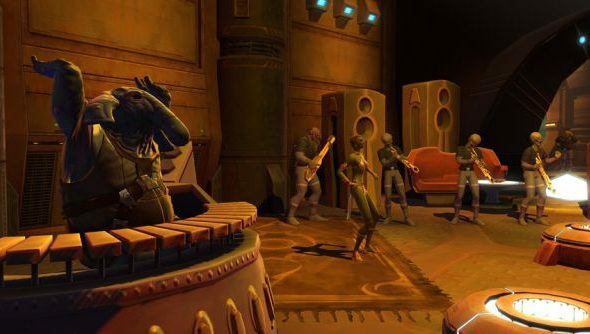 For raiders, SWTOR offers a buffet of options: 8 separate dungeons that can be played in standard, hard or nightmare modes, with a toggle to play in groups of eight or 16. Bosses are hard, and imaginative, and that’s a good thing. For most raids teamwork is essential. Charging in without a plan will get you killed or, through contextual environmental changes make the scenario needlessly difficult. In the Dread Palace operation, for instance, players will be targeted with an attack that once channelled, causes a section of the floor to fall away. Without a plan or clear communication it’s entirely possible to leave some players isolated and unable to join the fight. It’s particularly painful if a healer is cut off from the group. 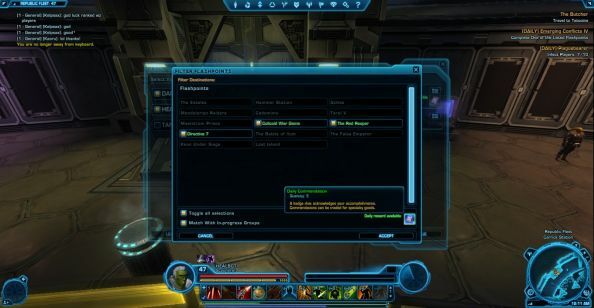 The level 55 hard mode flashpoints, SWTOR’s version of dungeons, make the endgame feel expansive. Rewards are generous now, where before more often than not, it felt like laborious grind. With the introduction of group finder it’s easy to chain grind flashpoints and hit meaningful reward targets per session. There’s also a very there’s a generous weekly reward tied to using group finder which makes finding sessions much easier. SWTOR feels like a game MMO veterans can finally be happy in. It’s growing, too: player housing and a host of new missions are coming soon. But focus has not been directed entirely at the end game players. Tactical flashpoints, scenarios where users are boosted to max level for the duration of the instance allow newbies to play with experienced players and gain valuable experience, resources and loot. These do not use the traditional 1 tank, 1 healer 2 DPS build. Instead any available player is placed into the flashpoint. Bioware listened to the end-gamers, activities at top level often took too long, they’ve redressed that with introduction of CZ-198 and Oricon. Now you have alternative activities to run through solo whilst you wait in group finder or for raids. These planets do not subject you to long rambly dialogue, they’re the perfect hubs for dailies. Just pick up your quests at a terminal at the start and away you go. 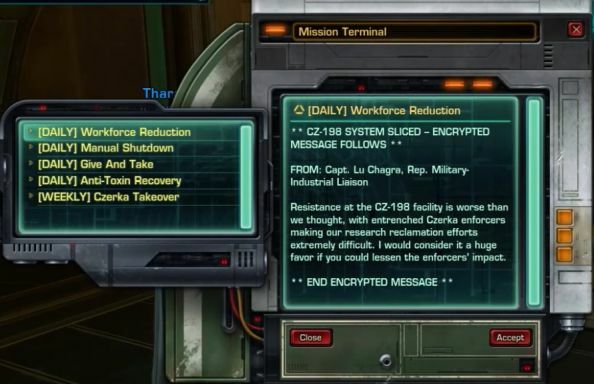 This mission terminal is from CZ-198; everything above takes place across four rooms and can be completed in under 10 minutes. Oricon takes a little longer but is still appreciably faster than the previous daily areas, the Black Hole and Section-X. There’s an elephant in the room though: The Old Republic’s weirdly obtuse free-to-play framework. Describing it as free-to-play isn’t really fair: it’s more of an extended, never ending trial, that, if you like it, will end up with you picking up a subscription. The free-to-play restrictions have been described as draconian: if you’re not subscribing you’ll face too few bank slots, you’ll only be able to run a restricted number of PvP battlegrounds, flashpoints and operations. You can unlock more slots with the paid for currency (cartel coins), but it is way more cost effective to buy a subscription. Once you are subscribed, though, SWTOR feels generous: with Tactical flashpoints, hard modes and group finder at max level it leaves you with plenty to do. You’ll stride past budget Jedi in threadbare robes, resplendent in high level gear often with extremely eye catching designs. Thanks to dye modules now you’re able to customise your character extensively, another complaint from the early days. And players have taken the system with enthusiasm. The general perception of SWTOR is that it is a game that struggles. But that’s no longer true. It has a sizeable community, increasingly refined mechanics, regular content updates and strong support from both the developer and publisher. Star Wars: The Old Republic is waiting for you. Why not return?